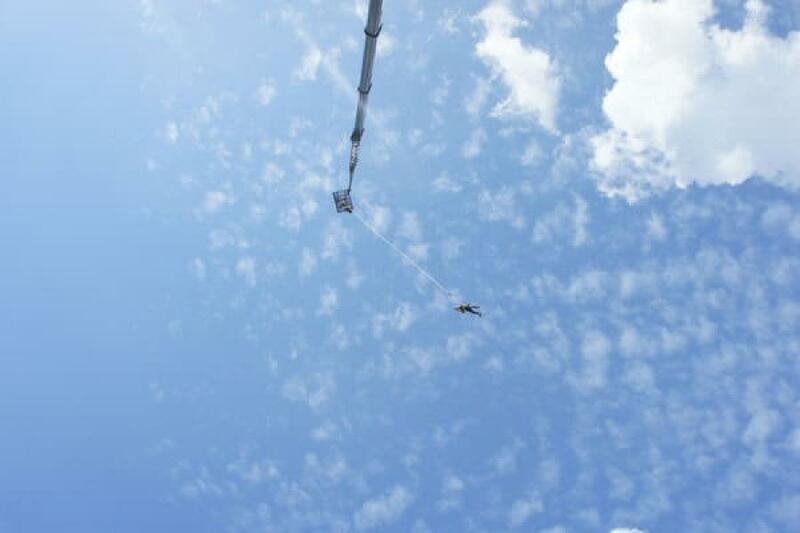 Catapult yourself backwards and get sky-high, with our reverse bungee jump experience. Putting all your faith into a body harness and single cord, feel the tension rise as you make your way to the platform. Once at the edge, your cord will stretch above your head until you’re ready for lift-off. Accelerate upwards and get closer to the clouds, with this unique thrill-ride. Booking required, after receiving gift pack and or E-Voucher. Please refer to your Voucher for booking contact details. Under 15’s require parent or guardian permission plus signature. Over 50’s must provide a doctor's certificate to take part. Max weight 120kg / 18.9 stone. Waist harness to fit sizes 40cm (15.7 Inches) - 125cm (49.2 Inches). Must wear suitable attire: no skirts, boots, glasses or hard contact lenses permitted. Must wear trainers and securely fastened shoes. Must inform operator if taking any form of medication. Not suitable for those suffering from high blood pressure, heart condition, dizziness, epilepsy, asthma, neurological conditions, or diabetes, or if you are pregnant, have damage to neck, back, spinal column, legs or eyes .